Posted on Tue, Dec 13, 2011 : 1:07 p.m.
Ann Arbor officials say they want some assurances city taxpayers will get their money's worth if and when the city's transit authority expands services countywide. As it stands now, some argue, it looks as if Ann Arbor taxpayers will continue paying a 2-mill transit levy and be asked to pay a new 1-mill levy for countywide service. 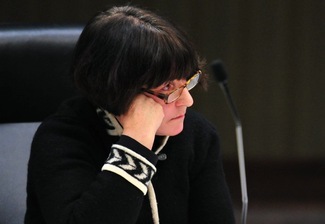 "I think we do need to look at if there's equity in the tax burden between what Ann Arbor taxpayers are paying and taxpayers in other jurisdictions," said City Council Member Jane Lumm, an Independent who represents the 2nd Ward. "I would rather see that it would be a millage of the same amount for all members of the county and that Ann Arbor would not have a higher millage," said Council Member Marcia Higgins, D-4th Ward. "Ann Arbor taxpayers have built into the system over a very long time." The countywide expansion of the Ann Arbor Transportation Authority — chartered in 1969 by the city of Ann Arbor — has been talked about for more than two years. Agency leaders now are approaching the cities of Ann Arbor and Ypsilanti, as well as Washtenaw County, asking them to enter into a four-party agreement that will lay the framework for creation of a new countywide transit authority in 2012. A countywide millage isn't guaranteed to be part of the equation, but it's one option for funding the expansion, said AATA CEO Michael Ford. Ford presented the plan for a four-party agreement to the Washtenaw County Board of Commissioners last week and received positive feedback. He made a similar sales pitch to the Ann Arbor City Council Monday night and received a mix of praise and concerns. A financial task force formed by the AATA this year is expected to issue a white paper in early 2012 with its funding recommendations for a new countywide authority. The AATA already released a 61-page report in August detailing possible funding strategies. The report shows a total of $598.8 million in planned service improvements over the next 30 years, while the AATA's operating costs grow from $25.1 million to $85.8 million. Hypothetical revenue sources include a 1-mill countywide tax eventually growing to 1.5 mills, layered on top of the 2 mills already levied in Ann Arbor. The report also suggests options such as public-private partnerships, tax-increment financing, local sales taxes, payroll taxes, parking fees, property millages, and increases in the state gas tax and vehicle licensing fees. Ann Arbor's existing 2-mill transit levy brings in about $9.5 million annually. An additional 1-mill countywide tax would bring in $14.5 million, including $4.6 million from Ann Arbor. The city of Ypsilanti also has a 1-mill transit levy that currently pays for AATA services. Lumm argued a 1-mill countywide tax on top of the 2 mills Ann Arbor taxpayers already pay for AATA transit services would be a significant increase. "To put it in perspective, it's more than our streets millage, more than our parks millages," she said. "And I think it's imperative, as we go forward, for Ann Arbor taxpayers to be assured that we'll be getting $4 million to $5 million (if another mill is added on) more benefit or value with this new five-year improvement plan when that is all fleshed out." Other council members were more upbeat about the expansion plan, which was shaped through feedback from dozens of community meetings and other outreach efforts. "Just because something is stretching out beyond our borders doesn't mean it doesn't benefit us," said Council Member Margie Teall, D-4th Ward. "I mean, we are going to be the beneficiaries of being able to take a bus outside of Ann Arbor." Ford stressed that the local jurisdictions and the county would not have to take on any financial liabilities, nor would they be asked to make any requests for funding. He said he hopes to have the four parties approve the agreement in January. After that, there are several more steps before a countywide authority is formed. Ann Arbor City Council Member Jane Lumm asked several questions about AATA's expansion plan Monday night. An unincorporated countywide transit authority board — made up of officials from throughout the county — has held three meetings so far and is working on developing a five-year transit improvement program to present to municipalities before incorporating. Ford said he expects the five-year plan to come out in either the second or third quarter of 2012. It will include service development plans, recommendations on funding, fare structuring and policies for a countywide transit authority. After that report is published, the unincorporated board will request that the county file the articles of incorporation to officially create a new countywide authority. At that point, any municipality in the county that does not want to be taxed or receive transit service through the new authority can opt out. It's possible some townships might not want to be included. If and when funding for a countywide authority is established, Ford said, Ann Arbor and Ypsilanti would transfer their transit millages to the new authority to maintain current services, and AATA would transfer its assets to the new authority as well. After the incorporation, Ford said, the new body would be able to try once per year through 2014 to win voter approval for a countywide transit millage before the authority dissolves. Ford said in an interview with AnnArbor.com that going to voters as early as November 2012 might be an overly optimistic timeline. 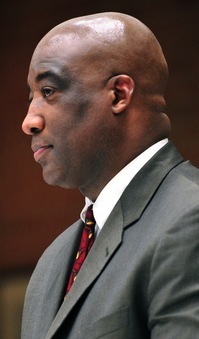 Council Member Christopher Taylor, D-3rd Ward, said he appreciated learning that approval of the four-party agreement does not automatically guarantee the transfer of Ann Arbor's transit millage to a new authority. That's apparently contingent upon approval of funding for the new authority, whether that's through a countywide millage or otherwise. 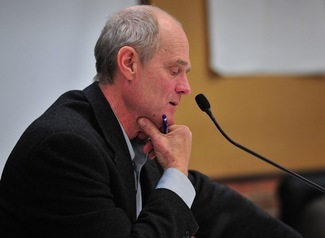 In the event a countywide millage is approved by county voters, Taylor said, he'd like the four-party agreement to require that the transfer of Ann Arbor's millage be contingent upon the countywide expansion also winning support from a majority of city voters. Mayor John Hieftje said he expects the four-party agreement to come back to the City Council for consideration in January. But he said it sounds like there's still much discussion to be had and it could take more than one meeting to get it through. Hieftje said the countywide expansion is going to be particularly beneficial to the Ann Arbor business community. "As we look at a planet that is coming out of a worldwide recession, and we look at a carbon-challenged future, every prognosticator that I've looked at is predicting higher fuel prices," he said. "And I think businesses are concerned about how their employees are going to get into work in Ann Arbor, and how their customers are going to get to Ann Arbor." Mayor John Hieftje speaks about the benefits of AATA's countywide transit plan at Monday's meeting. "So I don't know that we need to think this is going to be a millage at any point," he said. "I can see how it always comes up, because that's what people are used to, but there are a lot of other systems of funding transit being talked about right now, and I think we have a governor in place who has proven he's transit-friendly." Ford chimed in with "very much so." There are many reasons why residents should be excited about a countywide expansion, Ford said, including potential to reduce traffic congestion, mitigate the need for downtown parking, create a more walkable and bikeable community, and help sustain the environment. He said transit can be transformational in promoting livability and economic vitality. But to get there, he said, the community needs to improve the current system with high-capacity transit where appropriate, more direct routes, more frequent service, weekend and late night service, easier transfers and more options so motorists can leave their cars at home. Mentioning shuttle service to Detroit Metro Airport and increased bus service between Ann Arbor and Ypsilanti, Ford said AATA officials already are working on service enhancements that will benefit Ann Arbor. Hieftje said one of the features he's most looking forward to is an east-west commuter rail line that will make possible 10-minute trips between Ann Arbor and Ypsilanti. Ford said the AATA is working on a revised version of its 30-year transit master plan. But for purposes of the countywide expansion, he said, the focus is on putting together a five-year program that can be funded in the short-term. "We're going out back to the communities and talking to them about specific needs that they have for service," Ford said, "really down to a gnat's eyebrow to make sure that we really understand what those needs are and how to combine those efforts together." The makeup of the unincorporated countywide transit authority board that is working on coming up with a five-year program to be funded by either a countywide millage or some other funding mechanism. Wed, Dec 14, 2011 : 5:26 p.m.
What remarkable timing. Last weekend I received a letter with $2 attached and advising me that I could earn an additional $5 if I took a survey before December 16th. I figured, why not. I got the website and it was obvious that this was being paid for by AATA. If I remember correctly the first question was &quot;Was I aware that AATA was the Official Transportation Agency of Washtenaw County&quot; or words to that effect. A wee bit presumptuous and not truthful. It went on to determine if there were support for a county wide millage for transportation invoking concerns about transportation for the elderly and infirm on a number of questions. It also raised the issue of fairness with the transportation funding already provided by Ann Arbor and Ypsilanti for what purpose I don't know. It raised the question of the rail line between Detroit and Ann Arbor and Metro Airport. Nowhere is long term funding discussed. It is pointedly ignored with what appears to be the assumption a county wide millage will pay for everything. Dream on. This survey was obviously designed to solicit a result that would be favorable to AATA. I will never endorse any proposal by AATA because they cannot be trusted to tell the truth and have no idea of fiscal responsibility. Look how much money they have spent trying to sell this millage. What makes it even better is that the survey was not even done by a Michigan company. The final irony is that it was done by CFI Research Corporation of Columbus, OH. That was a politically dumb move by AATA. I don't care but I would guess a number of others might be offended. Wed, Dec 14, 2011 : 2:53 p.m.
As mentioned above, hopefully the governor's regional transit authority will put an end to this &quot;not so smart&quot; plan. Shame on the mayor and his AATA appointees for mismanaging city resources and once again using the Ann Arbor taxpayer to subsidize their pet projects (ie: Fuller garage, etc., etc.)!! Wed, Dec 14, 2011 : 1:13 p.m. This is all a scam on the taxpayers. Gov. Snyder and Pres Obama have already come out in favor of a regional transportation authority ... light rail/subway with connector buses. The executives salaries at AATA are vastly higher than comparable execs, CEO Ford gave the UofM reply of &quot;Ya gotta pay big to get the best&quot; then he hires Dumb and Dumber. It's all Empire building getting ready to make the jump to Metro Detroit Regional Transportation CEO. Come on Ann Arbor don't be a Patsy. Wed, Dec 14, 2011 : 6:37 a.m.
Make drivers pay their fair share: make them pay for roads, for pollution mitigation, for parking, etc. A tiny increase in property taxes will seem a lot more attractive in contrast to the actual cost of driving. Wed, Dec 14, 2011 : 3:44 a.m. This proposal is a triumph of ideology over reality. Sending empty buses back and forth across the countryside is NOT a way to save money, energy or congestion. And certainly not tax dollars! Ann Arborites do not generally travel to places like Manchester, Saline and Milan--except for the annual chicken broil, for which they would rather take the family car. Some people from those places prefer to live there--lower taxes, after all--and commute to their jobs in Ann Arbor. Fine. Why doesn't AATA just establish a bulletin board on which they can all register their names, contact each other, and together lease or buy a van. The Ypsi-Ann Arbor line is something else, as the city's economy just doesn't work without employees from there. But the folks in Manchester can generally afford to fend for themselves. Why should AA taxpayers make it cheaper for more people who work in the city to move out of the city--lowering our tax base and reducing our ability to provide needed services? If AATA wants to provide bus service once a year to the Chicken Broil, and if Ann Arborites going there are willing to pay something close to full freigh for thatg service, fine. But send the &quot;Smart Plan&quot; back to the Smart Planners--and kill AATA's plans to spend hundreds of thousands of taxpayer dollars to sell it to the taxpayers. AATA should give priority to running a more efficient operation in the city before it plans to spread itself county-wide. Wed, Dec 14, 2011 : 3:28 a.m. I don't live in Ann Arbor, but I agree that Ann Arbor residents shouldn't have to pay more than the 2 mills the already do for AATA. But those of you who seem to think Ann Arbor can get along without the rest of the county obviously haven't looked around at who actually works in Ann Arbor, and how much they have to pay to get into the city and park. If you want to keep funding behemoth underground parking lots at $72,000 per parking space like the one next to the library, that's your decision. (Is that &quot;medical&quot; marijuana I smell?) But if you think transit to the rest of the county won't help Ann Arbor make ends meet, you haven't looked much further than the end of your nose. Thu, Dec 15, 2011 : 5:05 p.m.
Actually, Larry, I agree with you (which may surprise you given our other online conversations). I have always supported the idea of an expanded public transit system, especially to accommodate the greater urban area including Ypsilanti. What I object to in this plan is that it overreaches in making both commuter rail and the high-capacity connectors part of the future funding drain, and also the airport shuttle (a service which already exists) and express buses at low fare levels as far as Livonia. My fear is that this will create a system that actually undermines bus transit for those who depend on it. You won't find me defending the Big Hole either. Wed, Dec 14, 2011 : 3:20 a.m.
&quot;There are many reasons why residents should be excited about a countywide expansion, Ford said, including potential to reduce traffic congestion, mitigate the need for downtown parking, create a more walkable and bikeable community, and help sustain the environment.&quot; Boy this must be the best proposal since sliced bread! LOL. Is he sure it won't alleviate the homeless and cure cancer too? What a crock! AATA buses do not have enough riders to make much of a difference in any of those mentioned miracles! Wed, Dec 14, 2011 : 12:45 a.m. I spent my 8-12th grades growing up in the Portland, Oregon metropolitan area, where a mass transist system exists across 3 large counties and even across the Columbia River into Vancouver, Washington. The transit planning was integrated into true regional planning, reducing sprawl and increasing density which makes mass transit work. If you must reject the AATA plan, fine, reject it in favor of working toward a regional solution instead of the penny ante plan where townships can opt out. Wed, Dec 14, 2011 : 12:14 a.m. When will the people on City Council quit using Ann Arbor Taxpayers money to subsidize county type operations? Don't you learn from other places that subsidize Sheriff patrols in Ypsi Township???? So Ann Arbor People will be paying 3.5 mils and everyone else in the county 1.5 mils? Why? Ann Arbor City Council just agreed to subsidize Washtenaw County Sheriff's with an exhorbinate contract for Police dispatching. Ann Arbor people need to stand up and say enough is enough! We want our services here, we have the money....we want the service in Ann Arbor. I am all for being charitable and give a significant amount to the Delonis Center and other organizations that truly help people in need. But, that is my choice for my money. I do not ride the bus but this plan calls for me to start paying for someone in Ypsilanti to ride the bus around Ypsi Township????? If the people on Ann Arbor City council want to keep giving away responsibility and our money I say vote them out. I voted and chose to live in Ann Arbor NOT Washtenaw County. Wed, Dec 14, 2011 : 7:20 a.m.
Ypsilanti Township residents pay for contractual services with the WCSD. So I'm confused on your statement: &quot;Don't you learn from other places that subsidize Sheriff patrols in Ypsi Township??? ?&quot; Huh? Tue, Dec 13, 2011 : 10:54 p.m. Please make sure when you do te whole &quot;gnat's eyebrow&quot; thing and ask the community about their needs, you ask them how much they need to pay MORE taxes AND more property taxes. Are you serious? You're going to keep piling on millages and taxes? TO EXPAND!!???? And it's completely based on a PERCEIVED need, perceived by the people that want more money. I mean seriously, is everyone reading this story? What in the absolute every swear word in the book is going on in this city? How is it posible that they continue with all these expansions and rate increases? I feel like I'm taking crazy pills! I really wish we weren't so far under water on our mortgage. I'd really REALLY like to get away from here now. Tue, Dec 13, 2011 : 9:55 p.m.
All the AATA has done in the last 5 years is CUT routes and services. Now they are talking about expanding? &quot;Hypothetical revenue sources include a 1-mill countywide tax eventually growing to 1.5 mills, layered on top of the 2 mills already levied in Ann Arbor. The report also suggests options such as public-private partnerships, tax-increment financing, local sales taxes, payroll taxes, parking fees, property millages, and increases in the state gas tax and vehicle licensing fees.&quot; Get ready, folks, for higher taxes and fees all around. And get ready for a huge increase in the vehicle licensing fees. I've heard &quot;they&quot; in Lansing are thinking of adding $125 to each vehicle registration in the state to fix the roads. What are they doing with the current $$ allocated to road repair and maintenance? &quot;...more options so motorists can leave their cars at home...&quot; So, how exactly will people get to these transportation hubs where they can theoretically take a bus or train somewhere? What are the options, more door to door buses or vans, using gas and driving on the poor roads? Tue, Dec 13, 2011 : 9:29 p.m.
Ann Arbor reasonably pays more into any tax system, because it has more money. In the past when corporations paid property taxes, this was not an issue. No longer requiring these corporations to pay these taxes did not keep them here. It did not bring more employment, as promised. When those corporations paid taxes, we could afford good schools, good highways and good public services. Many workers in the &quot;service industry&quot; cannot afford housing in A2 and rely on buses to get to their jobs. If it weren't for the politics of the Big 3 auto makers, Michigan would already have good transit systems in place like many other states. Tue, Dec 13, 2011 : 9:01 p.m. I had received an email regarding a meeting at Ypsi. Twp. Civic Center. There is no service to there. If you wanted to go County wide are there jobs? And lets say you found one on the night shift how would you get home? Routes end at 10-11 P.M.
Tue, Dec 13, 2011 : 8:27 p.m.
&quot;Just because something is stretching out beyond our borders doesn't mean it doesn't benefit us,&quot; said Council Member Margie Teall, D-4th Ward. &quot;I mean, we are going to be the beneficiaries of being able to take a bus outside of Ann Arbor.&quot; Um, NO. We are not all going to be taking a bus outside of Ann Arbor, but we'll be financing it? Isn't the sprawl in Michigan now viewed as unsustainable by our current state government, and rural services being consolidated as a result?? How about using our tax money toward something that has a chance of being useful and encouraging population/business growth (meaning more on the tax rolls), like a commuter rail? Every time I see a poll, people chose train over bus by a large margiin, and it'd free up our already clogged and broken roads. A link between Ann Arbor and Ypsi makes a lot more sense than fostering rural bus travel. Wed, Dec 14, 2011 : 6:33 a.m. The countywide plan will promote more concentrated land use, since people who want to live in Saline, for instance, will be more likely to live closer to the town center so as to be able to use the bus. Not extending bus service to the county will make outlying communities reliant on the car, which will be a detriment to them and to us. Tue, Dec 13, 2011 : 7:53 p.m.
&quot;I would rather see that it would be a millage of the same amount for all members of the county and that Ann Arbor would not have a higher millage,&quot; said Council Member Marcia Higgins, D-4th Ward. &quot;Ann Arbor taxpayers have built into the system over a very long time.&quot; IOW, this is the city's bright idea of fostering the cost of AATA on to the rest of the county. And MOST of the county will never use this service yet will be stuck paying for it. Let those who use it pay for it. Increase the cost of the bus fare and leave the rest of the county out of it. Tue, Dec 13, 2011 : 7:33 p.m.
No, no, no no no. &quot;County wide&quot; transit is a terrible idea no matter the funding scheme. I can't even get a ride from Ypsilanti to Ann Arbor after 5pm on some days (on routes that are almost always full when they ARE scheduled). 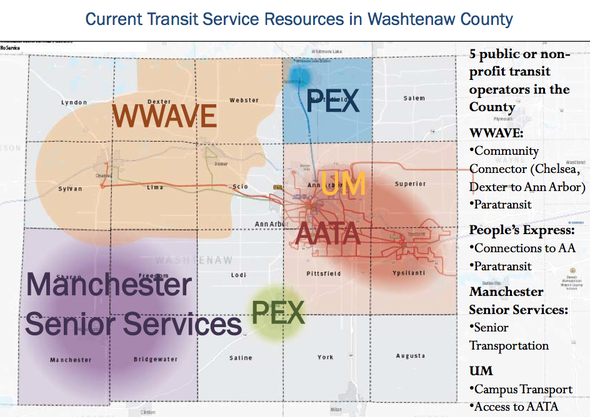 If rural Washtenaw county wants transit, let them develop it. AATA needs to focus on expanding its service on existing routes, or at least ending &quot;OWL&quot; routes. . AATA ends ridiculously early in the places that actually use it. Why is AATA seeking new &quot;customers&quot; outside of its mission when it should be making the system more usable for those who already use it--and live in places with transit-appropriate density? The priorities here are completely misaligned and &quot;county wide transit&quot; needs to be torpedoed in favor of better service who current riders. Tue, Dec 13, 2011 : 8:15 p.m.
&quot;If rural Washtenaw county wants transit, let them develop it.&quot; &quot;Why is AATA seeking new &quot;customers&quot; outside of its mission when it should be making the system more usable for those who already use it--and live in places with transit-appropriate density? &quot; Totally agree. Tue, Dec 13, 2011 : 7:35 p.m.
Ugh, death to autotext. You all get my point, I hope. Tue, Dec 13, 2011 : 7:34 p.m. Shoot, &quot;starting&quot; OWL routes, not &quot;ending&quot;! Tue, Dec 13, 2011 : 7:18 p.m. So, if I am understanding this correctly; we will pay 3 mils in A2 and Ypsi is going to pay 2 mils? Just several weeks ago A2.com reported that Ypsi's new Transit millage was not adequate to pay for the current level of service, and the already &quot;cash strapped&quot; City was going to have to pay additional money from the General Fund? Ypsi? more than likely the next City to be in need of a State appointed Financial Manager? Don't mean to sound negative, but GEEZ!! Tue, Dec 13, 2011 : 7:43 p.m. Here is roughly how it would stack up, based on current property valuations. Ann Arbor current 2+ mills - $9 million Ann Arbor new 1 mill - $4.4 million Ypsilanti current 1 mill - $.29 million Ypsilanti new 1 mill - $.29 million Rest of participating townships 1 mill - $7.6 million The plan currently needs about $12 million per year more than is coming in so that millage would just about work. See <a href="https://localannarbor.wordpress.com/2011/11/18/aata-moving-us-where-iii-where-the-money-is/" rel='nofollow'>https://localannarbor.wordpress.com/2011/11/18/aata-moving-us-where-iii-where-the-money-is/</a> for more explanation. Tue, Dec 13, 2011 : 6:54 p.m. Kudos to Lumm (and even) Higgins for acutally questioning a poorly planned, feel good, tax increase that will only drive more people from their homes as A2 becomes less affordable. &quot;Just because something is stretching out beyond our borders doesn't mean it doesn't benefit us,&quot; said Council Member Margie Teall, D-4th Ward. &quot;I mean, we are going to be the beneficiaries of being able to take a bus outside of Ann Arbor.&quot; &quot;We&quot;? Maggie Teall, who makes me embarassed to be a Democrat. She surely loves spending other people's tax dollars on everything that comes along, doesn't she? No questions asked. If anyone doesn't believe these 'extra' Ann Arbor tax dollars aren't going directly to commupter rail, compliments of our Mayoraand his bosom buddy Rick Snyder, then I have a bridge to sell you on Stadium. Tue, Dec 13, 2011 : 6:46 p.m.
Ann Arbor is being set up to get some more of what it deserves..... &quot;The report also suggests options such as public-private partnerships, tax-increment financing, local sales taxes, payroll taxes, parking fees, property millages, and increases in the state gas tax and vehicle licensing fees.&quot; My God.....my head is spinning!! Wed, Dec 14, 2011 : 4:18 p.m.
Just wait a bit and see what's coming. With a faltering revenue stream for governing bodies this is the only way it can go - taxes and fees rising with your financials sinking more. This is the actual trickle down theory. Soon the rest of you will be spinning. Tue, Dec 13, 2011 : 6:43 p.m.